Implant Dentist in Lancaster Reaches Fellowship! Congratulations to Dr. Mahima Gupta for reaching Fellowship status with the prestigious International Congress of Oral Implantologists, (ICOI). Gaining Fellowship required Dr. Gupta to complete over 100 hours of continuing education in the field of implant dentistry, and to present 20 completed implant cases, including both surgery and restoration. This means that if you need to replace one or more missing teeth, you can rest assured that you’re choosing an expert when you work with Dr. Gupta! Without a root to support, your jawbone begins to deteriorate. This not only changes the appearance of your face, it also eliminates support for your remaining teeth. When a tooth is missing, your healthy teeth begin to shift into the open space, putting them at an increased risk of fractures or other damage. A misaligned bite can also contribute to problems with your jaw joint. Known as dentistry’s gold standard for tooth replacement, dental implants are a very successful and reliable treatment. This is because an implant replaces both your natural root structure with a titanium post, and your tooth with a porcelain crown. There is no other option that offers those benefits for patients. Dr. Gupta will place the implant into your jawbone during a short surgical procedure. Because titanium is biocompatible, it naturally integrates with your bone over time, creating a stable foundation for your new tooth. Healing takes 3-5 months to complete. 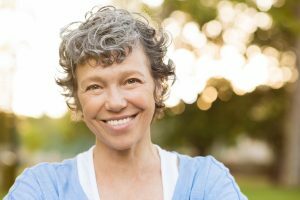 Dental implants in Lancaster can also be used to support dental prosthetics such as a bridge or full denture, which means that patients missing multiple teeth can also enjoy the benefits they have to offer. After the appropriate healing time has passed, Dr. Gupta will restore your tooth with a porcelain crown customized to mimic both the shape and appearance of your natural tooth. Your new crown will offer all the function of eating and chewing you had before, while also naturally complementing your smile. Dr. Gupta can determine if dental implants are right for your needs during an examination and with some x-rays. She’s looking to see that there’s enough healthy bone structure present to support the implant and that you’re in good overall health. Patients love the fact that they can work with Dr. Gupta from start to finish during their implant treatment without having to be referred elsewhere for care. Are your ready to reclaim your smile, confidence, and oral health? Contact Lancaster Family Smiles today to schedule your implant consultation with Dr. Gupta. Comments Off on Implant Dentist in Lancaster Reaches Fellowship!